Greg Hogan for G-Force Employment Solutions takes out the AEN 2016 Apprentice of the Year Award at the Apprenticeship Employment Network Annual Awards Dinner held tonight at Waterfront Venue Docklands. Apprenticeship Employment Network (AEN) is Victoria’s largest apprentice and trainee employer network with their members securing employment for 150,000 apprentices and trainees over the last 30 years. Their awards ceremony is held annually to acknowledge the outstanding achievements of our members, staff, apprentices and trainees within the Victorian GTO industry. The 2016 AEN Apprentice of the Year title is awarded to an apprentice that has displayed and demonstrated excellence in their study, training and work. This years’ recipient, Greg Hogan, was no exception. Currently undertaking a Certificate III in Upholstery through G-Force Employment Solutions with host employer Banksia Lounges, Hogan has been a dedicated apprentice showing a clear passion for his work. He has represented the industry, and apprenticeships in general, well showcasing leadership skills beyond his years. During his 3rd year of his apprenticeship, Hogan is leading the sewing team at Banksia Lounges teaching new staff how to sew to a high standard. Hogan was the 2016 Victorian winner of Holmesglen’s 2nd year Upholsterer of the Year, a prestigious achievement within the industry, further highlighting his skills, leadership and determination. The Apprentice of the Year award additionally acknowledges apprentices who have actively contributed to their community outside of their apprenticeship. Hogan is involved in the cycling community, training and competing at an elite level racing in Australia and around the world. He is also a mentor to junior cyclists in developing necessary bike handling skills, health and wellbeing tips and mind sets to assist them in their sporting endeavours and life. 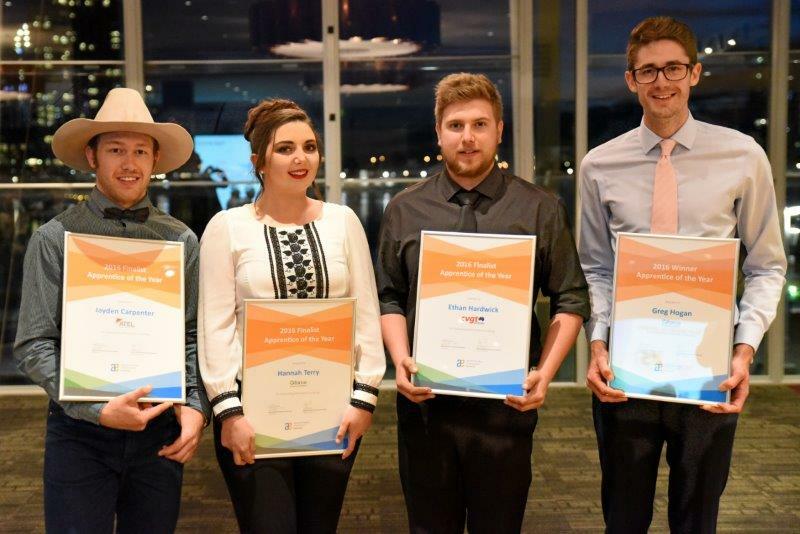 While this year’s nominees were of a high calibre, Hogan represents the values of Apprenticeship Employment Network and was the epitome of an outstanding and deserving apprentice. Greg was up against Hannah Terry (G-Force Employment Solutions), Ethan Hardwick (CVGT), Jayden Carpenter (ATEL), William Maynard (Programmed) and Jack Lunney (Programmed). Further information on each nominee can be found on additional document. In the wider community Hannah is part of a programme in the Geelong area that assists youth with their careers. Ethan was short listed for a scholarship with CVGT Australia and was employed through their Group Training program. He is a hard worker, pays attention to detail and is driven to succeed. Successfully completed his second year of trade school and has since commenced his third year – six month early. Ethan is a career mentor & has played a key role both at Kangan and the greater community of Bendigo. Jayden’s eagerness and hardworking attitude clearly set him apart from other candidates from day one. Jayden secured an apprenticeship with a local Tiler, however this was short-lived when business slowed down. Determined he set out on his own and secured an apprenticeship with a local tiler. Exceeds set goals and has high expectations. Enthusiastic and determined individual, to succeed and provide for his family. Jack undertook a Certificate III in Electrotechnology followed by a Certificate IV Instrument & Control. Jack is employed with ESSO at the Long Island Point Facility, one of the most hazardous facilities in the southern hemisphere. Jack is pro-active in relation to safety talks at ESSO, and is an active participant in every aspect of his training.